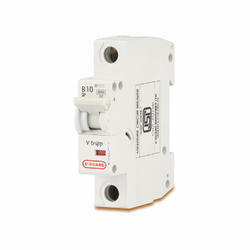 Pioneers in the industry, we offer v guard mcbs miniature circuit breaker from India. V-Guard MCBs, a range of Miniature Circuit Breakers which will make sure that your home is not just sweet but a safe place to live in too. The moment you have V-Guard MCB installed in your house you can just take a sigh of relief for a lifetime. V-Guard MCB comes with a clear and visible indication for circuit 'ON' 'OFF' status. V Guard MCB's are completely equipped with high quality thermal and magnetic protection modules can sense every each instants of circuitry. Watches the entire circuit and protects your home and appliances from short circuits and over loads and subsequent issues. MCB's are made as per latest international IEC standards with compact body design and beautiful aesthetics. All products are checked by Quality Controller on highly equipped labs of V Guard. Now stay assured for the maximum safety with V-Guard MCB which has been lab tested for improved and rugged design of operating mechanism. It has a silver graphite contact tip for anti-wield property. V-Guard MCB is a suitable choice to make your home safe as it fully complies with the international safety standards of IEC 60898-1. Not only this, its specially designed arc quenching chamber with additional arc diverter and flash back arrestor never ceases a single chance of fire.